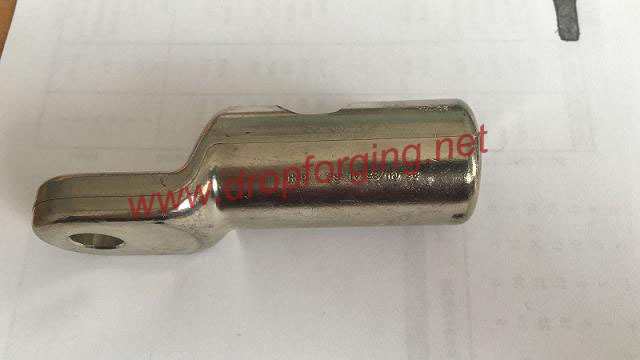 Aluminum forged able lugs are the the drop forging components mainly in the application of connecting cable and wire conductors in electrical installations and equipment. They are used when permanent, direct fastening methods are not feasible or necessary. In general, aluminum forged cable lugs are fixed to cables and wires while inserting the conductor/s into the barrel (tube) of the device and then barrel is crimped, soldered or welded onto the conductor for secure mechanical and electrical joint. Then, fasten connection end of the lug to connection point by means of a bolt, screw, or spring clip. There are lots of sizes, configurations and material types of aluminum forged cable lugs to suit particular applications. The functionality of a aluminum forged cable lug is one of the most safe and common method of cable termination. It is designed in a way that cable termination and removal for maintenance or repair is very simple, thus a cable lug is broadly used instead of direct fastening methods. It is also utilized by almost electrical equipment even in manufacturing of tires for vehicles, drums and many others. The various types of lugs consist of terminal lugs, tube lugs, fork lugs, bi metallic lugs and aluminum tubular lugs. The option for the material used in cable lugs depends on the type of the cable. Electrical cable lugs can be used on automobiles as the role of lugs for efficient performance of the machines is highly indispensable as well as in electrical boxes, transformers and generator machines. Aluminum forged cable lugs help you to connect electricity properly with low voltage drop and less thermal heat generation to avoid accident and terminal burnout. It is very necessary to use right sq mm size of lug and proper crimping lugs has to be done with the right suggested crimping tool. Also to be noted is that you buy lugs of good make so that you get. Why Aluminum Forging for Cable Lugs? Aluminum forging is the ideal production method for cable lug application to ensure critical performance and safety, but a lighter-weight metal. Aluminum forging offers a number of outstanding advantages over other manufacturing processes. Properties of the aluminum alloy represent only the beginning of end-user benefits. The forging process adds cable lugs superior mechanical and physical properties created by heat and pressure. As a professional aluminum forging supplier, Fly Forge offers custom service for aluminum forged cable lugs. Our cable lugs are precision produced in closed die forging process with material Aluminum 6061 or other forged aluminum alloys. Contact us if you would like to source a supplier for your aluminum forged cable lugs or other forged components.